Things to See and Do near St Leonards Farm Caravan & Camping Park and in Dorset and Hampshire! There is a huge range of things to see and do in and around Bournemouth and Poole, all within easy reach of our site. There are plenty of options for fun days out whatever the weather! BIC and Bournemouth Pavillion for shows and concerts. 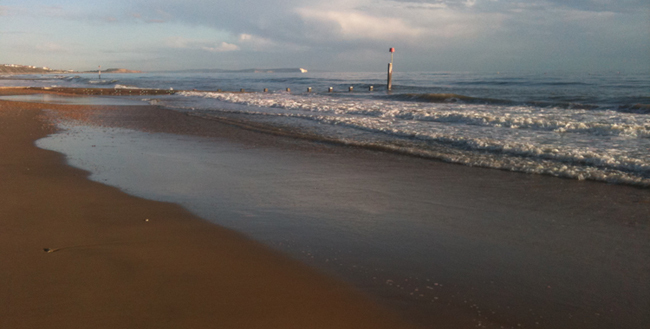 Boscombe and Bournemouth Beach to Sandbanks provide stunning sandy beaches for great days by the seaside. The New Forest is a beautiful National Park full of deer and horses ( and Wild Boar?). Sammy (5), Bella (3) & Arthur (1.5) say they have also seen a Gruffalo in the Forest but we can’t be sure as they didn’t take a photo…There are however dinosaurs on the Isle of Wight and you can take photos! The picturesque nearby market town of Wimborne Minster with its historic minster and model town, is well worth a visit and hosts an eventful and fun folk festival every year. The town of Christchurch has good restaurants and pubs and is located by the River Stour. The historic Priory and nearby castle ruins are worth a visit and when the weather is good there is a great water park next to the childrens’ play area in the park by the River Stour. The world famous ‘Jurassic Coast’ is host to the beautiful Lulworth Cove, dramatic Durdle Door and Kimmeridge Bay if you like fossil hunting. There are plenty of places to go and eat out if you don’t feel like cooking. There is the Smuggler’s Haunt Pub which has a Beefeater restaurant 10 minutes walk from the site and also a MacDonalds. The nearby market town of Wimborne Minster, only a short drive in the car of about 15 minutes, has a number of good restaurants and pubs such as the Olive Branch. In Christchurch try the Kings Head or Ye Old George Inn (YOGI to many!) for drinks and a bite to eat. Also in Christchurch is the Captain’s Club which offers fine dining and drinks in a stunning riverside location. Our nearest town of Ferndown has a choice of Italian and Indian and many takeaways including Indian , Chinese and pizza. Bournemouth itself has a huge choice of restaurants ranging from Chinese, Italian, Indian, Greek, Mexican, Spanish and decent pub food. We do not have an on site shop because we cannot compete with the large Sainsburys 5 minutes up the road or the Lidl 5 minutes walk from our entrance. There are also smaller local shops in Wimborne Minster and a Tesco Express in West Moors. There is a camping supply shop next to Oakdene Forest Park less than a mile away if you run out of tents pegs. The large Halfords next to the Lidl also sells tents if you need a new one. There is a very large and well stocked Go Outdoors camping supply store in Poole. Every August there is the famous Great Dorset Steam Fair. In late August there is the amazing Bournemouth Air Festival featuring stunning displays by the world famous Red Arrows and many other classic aircraft including Spitfires, Lancasters, Bi-Planes, F16’s and a Vulcan Bomber. In addition to the great places to visit listed above, the locality offers various activities such as boat hire, jet ski, sailing, swimming, horse riding, go carting, dry slope skiing, cycling, walking, fishing and golf. Our reception has loads of leaflets and brochures with further details.